Wigan made one change to the line up which won at Southampton last weekend when the suspended Antolin Alcaraz missed out. Maynor Figueroa dropped into the back three and Jean Beausejour came in at wing back. Stoke were still smarting from their Capital One Cup exit at home to Swindon Town but they had the bonus of new transfer deadline day signings Charlie Adam and Maurice Edu on the bench. 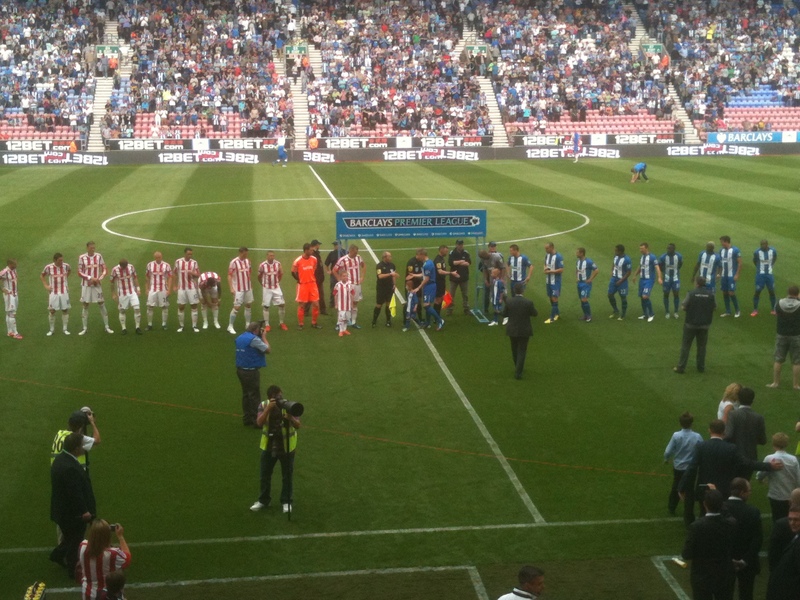 To say that Wigan and Stoke have contrasting styles of play is an understatement. Wigan like to get the ball down and pass it around while retaining possession. Stoke have a different way, they prefer the long ball, the high ball, in fact any high ball which goes via the stratosphere onto Peter Crouch’s head. The difference in approaches could not be more pronounced. For the opening 40 minutes it was the Latics who dominated possession, the tiki-taka, the pass and move made it impossible for the Stoke players to get a foothold in the game. The Latics zipped the ball around and denied their opponents early touches. After only 5 minutes Robert Huth gifted Wigan a penalty when he handled James McCarthy’s shot in the area and Scottish international Shaun Maloney confidently converted the spot kick. Given the boost of an early lead Wigan took control. They looked to have secured another penalty on fifteen minutes, when Franco Di Santo appeared to be sandwiched by Ryan Shawcross and Andy Wilkinson, but Martin Atkinson turned away the Latics players appeals. Wigan should have doubled their lead soon afterwards when Arouna Kone missed a great opportunity after Emmerson Boyce had looped Di Santo’s centre back across the six-yard area. Stoke manager Tony Pulis encourages his often large and physical players to out jump their opponents and impose themselves physically. Set pieces, throw ins and corners are their bread and butter. So it is somewhat surprising that the Potters have signed Charlie Adam from Liverpool, a creative midfielder who can pass it short as well as long. He was introduced on 36 minutes, when Wilkinson was withdrawn with head injury, in an attempt to stem the tide of Wigan attacks. Adam was soon being encouraged to knock it long by the increasingly loud and animated Pulis. Somewhat against the run of play, the largest man on the pitch, Peter Crouch won a penalty in the 40th minute when his heavy touch ricocheted off Maynor Figueroa’s arm and referee Atkinson awarded a penalty. Jonathan Walters calmly dispatched the penalty past Ali Al Habsi. Wigan had dominated the opening half producing some stylish football in the process but they were clearly frustrated to go into the break on level terms. The second half started in lively fashion with Michael Kightly driving a shot into Al Habsi’s arms, but Wigan continued to attack and after Arouna Koné had just failed to find the right pass after a run into the area, Emmerson Boyce struck an effort just wide of the right hand post. In the 49th minute Wigan took the lead when a good break by Kone appeared to have ended but the Ivorian picked out Di Santo with an neat pass and for the second week running the Argentinean coolly found the back of the net. Stoke rallied and began to impose their physical game launching high balls into the Wigan penalty area. Another six footer Cameron Jerome was thrown on to bolster the line as Kightly was withdrawn. Inevitably it was Crouch who then provided the equaliser with 14 minutes remaining, leaping to nod in Walters’ cross after Emmerson Boyce switched off to a quick thrown in. Al Habsi produced a full length save to deny substitute Cameron Jerome, before pulling off one of the saves of the season when he kept out Adam’s free-kick after it deflected off Gary Caldwell. The final minutes were end-to-end stuff and the home fans cried out for another penalty as Shawcross tackled Wigan substitute Ryo Miyaichi in the box, but Atkinson once again waved away appeals. A point for both sides takes Wigan up to 7th and Stoke to 10th in the league table. Two extremely different styles of football, but I know which I would prefer to watch every week. I’m also going to stick my neck out and say that Wigan’s brand of football will enable them to finish higher up the table than the Potters this season. This entry was posted in Franco Di Santo, Jonathan Walters, Peter Crouch, Shaun Maloney, Stoke City, Wigan Athletic and tagged Franco Di Santo, Jonathan Walters, Peter Crouch, Shaun Maloney, Stoke City, Wigan Athletic. Bookmark the permalink. Completely agree with your report. Walked to ground from town centre with two Stoke fans who were fed up with their style of play and I was quite surprised what they were saying considering how well they’ve done. Having watched the game I could understand what they were saying and at times couldn’t believe how direct they were, especially the back four who never took more than 2 touches before kicking the ball anywhere hoping for the best. We were terrific for spells but just needed a two goal cussion to guarantee the 3 points. Think we miss the width Moses offered but hopefully Miyachi will grow and be able to effect games against less physical sides. Overall a draw was a fair result as we played better football but Stoke had the better chances, although they were created through just hit and hope football. Hopefully we’ll fair better against teams who come and try to play passing football against us and having watched yesterday’s game I think the signs are encouraging. As you say there are rumblings from the Stoke fans, I spoke to some before the game and they were also unhappy with the style of play. Pulis demands the long and high ball and it was noticeable that there were boos when he took Kightly off and introduced another big man in Cameron Jerome. Wigan are definitely building on their form from the end of last season and I’m hopeful that we can push for a mid-table finish this time around.